I think it should not be there in the first place, but I'll fix that when I'll get home (next week). Is it right that ML on 5DII can't increase frame rate to 60fps ? or 50fps, or 65fps ? with Frame over ride enable. Been away awhile and see alot has changed, For us Mkii users (and others im guessing) its either Stable release or if wanting to test new features use nightly builds? cheers guys. Also, i cant find a working MLV extractor for Mac, im on 10.8.5 and non are booting or extracting. Cheers again. I used izip Stuffit Expander. I have 10.9.2 as well. When I click to open the zip a duplicate .cpgz file pops up. There're other files in the download with the zip file so it may have unzipped automatically but I don't know the exact contents in the zip so I have nothing to compare it to. This may be the contents I need to upload to my card but I don't know. If anyone has any suggestions please let me know. I just don't want to risk turning my camera into a brick. I never saw any .cpgz file. I suggest to delete and ignore it and/or to use another zip application. By the way: OSX (just as windows) can unzip zip files right from the finder without any third party software. And it does it correctly! I tried unzipping it from the finder menu first and it just created the .cpgz file. Same with the other two zip applications I downloaded. I also tried downloading and unzipping it on 3 other computers (all Macs) and it did the exact same thing. I'm not sure why it seems to be so simple for everyone else but me. Has anyone else had this problem or am I the only one in the universe? Because I've looked through various forums and can't seem to find anyone who's had this issue. There're other files in the download with the zip file so it may have unzipped automatically but I don't know the exact contents in the zip so I have nothing to compare it to. This may be the contents I need to upload to my card but I don't know. If anyone has any suggestions please let me know. I just don't want to risk turning my camera into a brick. Yes that it, just ignore that .cpgz file , it's a Compressed UNIX CPIO Archive file. You only need 4 modules to record mlv video+audio, "5D2_212.sym, file_man.mo, mlv_rec.mo, mlv_snd.mo". first of all. really awesome guide with all the infos needed in one compact place. thank you. also thx to the devs of course! 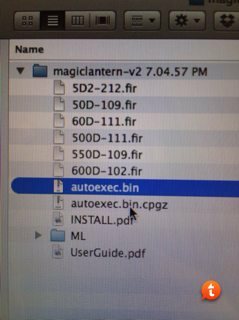 I just updated to the last nightly magiclantern-Nightly.2014Apr07.5D2212. everything seems to work just fine, but one small thing changed from the a.d build I had before ( 2b804e8cdd3c ), which kind of bothers me. there, when you disabled global draw, it still showed you a white rectangle which indicated the size which gets recorded. sry, english is not my first language. what I mean is you had a small rectangle if for example you choose 1728x972 and an smaller one if you choose 1728x824. would it be possible to implement this again? EDIT: Ah, pravdomil already posted here that this is one of two features which were not brought back to the main branch. so this is already known. I'm just kindly asking, is there any work going on to bring this features to the unified branch? Today I could record with 1728x972@25p on a 128GB 1000x KB CF card for as long as nearly 10mins (before I pressed stop). Now I only get about 30seconds (~1500 frames). I hope this somehow can help you guys with merging the forks. Sure it will help speedup but it will tell you if you issue recording to card. Edit: use adobe color space in camera , will give you better skin tones and better color in general. In other words: you claim, that the image recorded by raw_rec or mlv_rec differs when you change the color space of the camera? "Adobe Color Space" is a RGB color space and thus NOT raw! It's used for compressing to jpg. So, the RAW buffer, ML reads from is not affected. It's up to everyone in what color space one works later on the computer. Here you will definitely get different results. But the .raw or .mlv files will always look the same! the image recorded by raw_rec or mlv_rec differs when you change the color space of the camera? And virtually all skin tones are within the sRGB color space. So AdobeRGB isn't going to do anything about that, either. Being HDMI & Live View still go though Jpeg chip and I capture live view via hdmi recorder there is processing and I find in adobe color space the image is nice( fuller). And the capture image look the same as the raw image. Plus I still use H264 , so it only make sense to use it. The color profile is used for tagging the output. It is not used during processing. The YCbCr (video) format uses color matrices, such as Rec. ITU-R BT. 709. RGB color profile do not apply here, either. Some form of grading is applied to video information via picture styles, and again, the video (output) is tagged with a color matrix, not a color profile. http://www.magiclantern.fm/forum/index.php?topic=7443.msg99136#msg99136 . So there some stuff going, but each to there own. For everyone, I found a really good read on canon raw and it gives a very good understanding of what Canon is doing there. I found it Very Interesting. Link: http://lclevy.free.fr/cr2/ "Understanding What is stored in a Canon RAW"
Which has nothing to do with the way the data is tagged. The only thing these formats have in common, is that they both transport digital information. HDMI 1.3 was released June 22, 2006 and increased the single-link bandwidth to 340 MHz (10.2 Gbit/s). That shows a basic diagram of the processing chain. Again, it shows nothing about the way the data is tagged. The color space information, is simply a tag. It gets added to the files metadata, to instruct the processing software to transform the image data into a specific gamut. With raw data, this tag is simply ignored. Each raw processor will use it's own transfer characteristics, to transfer the raw data to RGB. I was wondering if any one has come up-pound any issue's recording audio in Crop mode with 5D2 an HDMI recorder attached and recording ? When I press the record button on 5D2 I was recording the Lv and recording crop mlv + Audio @ 44.1, I had a external Mic attached to the ninja and for some reason the audio on the ninja recorder increased in speed , so I had to in fcpx add a pitch filter with about (neg)-10% and slow it down on the timeline by the same amount. Every thing was fine and in sync in the recorder until I pressed the set button to record raw in crop mode then it just speeded up. There's no problem in 1:1 mode just in crop , but the wave file with the mlv was fine and in sync just the recorder had a problem. The Video was fine .